Landing at the Burke Baker Planetarium on April 19. The 24 Apollo astronauts who reached lunar orbit are the only humans to escape the bonds of Earth’s gravitational pull. 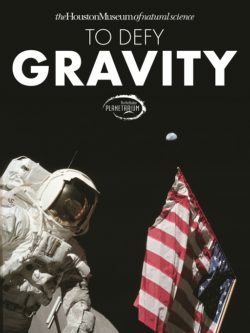 In To Defy Gravity, we share their exhilarating adventure on the moon and create a realistic future lunar colony where humans could enjoy this low gravity world. Then we explore the other worlds in our solar system, imagining how we might live and have fun there. Finally we look into the universe to understand what gravity really is and to appreciate its power in shaping our cosmos and determining our destiny. The moon is just the beginning of our exploration of gravity in action. This is an adventure for all ages with beautiful environments and a universe of new discoveries.